Navjot Singh Sidhu 20 October 1963 Indian Sardar Bhagwant Singh Politician, Actor, Cricketer Indian former cricketer and Member of Parliament from Amritsar between 2004 to 2014. After retirement from cricket he took up television commentary and politics. 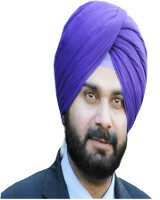 A list of popular Hindi Navjot Singh Sidhu quotes are given below.